If you want to use any of my pictures, please contact me. I got my first camera when I was 10 years old. Well the pictures sucked 😉 but I was improving of course and the cameras were getting bigger and bigger. Now if I take all my equipment I get problems with the Hand luggage weight. What I like most is taking pictures of landscapes, especially without people. Really quick I learned that you need to do something to reach those landscapes not everyone has seen, which for me means hiking. Usually during all my holidays some part is hiking. Going to places were the typical tourist does not go to, or if I go to typical tourist places do something else there. Hiking can be very short or basically the holiday (like a 2 week trek to Mt. 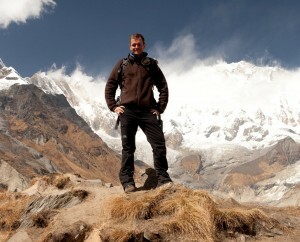 Everest Basecamp). Of course it is not possible to be at all locations at the perfect time of the day (from the light) but I try ;). Nowadays also animal photography is getting more and more interesting for me resulting in an anomous tele lens. Living at the Lake Constance also gives me a lot of photo opportunities around the year, especially with the alps just an hour away. Other than landscape/nature photography I did/tried a lot of things like wedding photography, street photography, architectural photgraphy concert photography, macro photography, etc. But still, getting landscapes into to the pictures is what I got my camera for. This map is an overview of the airports and flight routes I have travelled. From one of the highest (La Paz, Boliva, >4000m) to the most dangerous (Lukla, Nepal) to one of the biggest (Atlanta, USA). I came around a lot and I enjoy flying.